Create a one of kind quilted notebook cover featuring a painted sunflower on the outside cover. Notebook has inside pockets for coupons, business cards, customize to fit your needs. Techniques covered will be piecing base piece with fall accents. 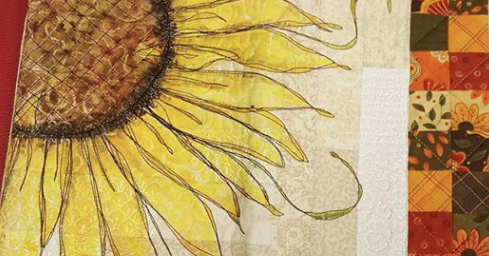 Sunflower is free motioned and painted using fabric medium and water color pencils and crayons.